LOCATION.--Lat 42°27'57", long 74°27'44" referenced to North American Datum of 1983, Schoharie County, NY, Hydrologic Unit 02020005, on left bank 2,300 ft upstream from West Kill, and 1.2 mi upstream from bridge on State Highway 30 in North Blenheim. PERIOD OF RECORD.--Occasional discharge measurements, water years 1969-70. October 1970 to current year (January 20 to September 30, 1996, discharges only for days of mean flow less than or equal to 400 ft³/s). REVISIONS HISTORY.--WDR NY-87-1: 1984(M). WDR NY-90-1: Drainage area. WDR-US-2011: 2010(M). GAGE.--Water-stage recorder and crest-stage gage. Datum of gage is 794.42 ft above NGVD of 1929. Prior to Oct. 1, 1971, at datum 1.00 ft higher. COOPERATION.--Records of flow provided by the New York Power Authority as explained in REMARKS. REMARKS.--Regulation of flow by New York Power Authority Blenheim-Gilboa Pumped Storage Project immediately upstream from gage. Entire flow, runoff from 315 mi², except for periods of spill, diverted from Schoharie Reservoir through Shandaken Tunnel into Esopus Creek upstream from Ashokan Reservoir for water supply of City of New York. For days of reservoir outflow greater than 10 ft³/s, see station 01350101. From Jan. 19, 1996, through Sept. 30, 1998, if flow was greater than about 400 ft³/s, undetermined amounts of flow bypassed the gage. From Oct. 1, 1998, through Sept. 30, 2000, if flow was greater than about 2,000 ft³/s, undetermined amounts of flow bypassed the gage. From Oct. 1, 2000, through Sept. 30, 2006, if flow was greater than about 5,000 ft³/s, undetermined amounts of flow bypassed the gage. From Oct. 1, 2006, through Aug. 27, 2011, if flow was greater than about 6,000 ft³/s, undetermined amounts of flow bypassed the gage. From Aug. 28, 2011, through Sept. 30, 2012, if flow was greater than about 30 ft³/s, undetermined amounts of flow bypassed the gage. 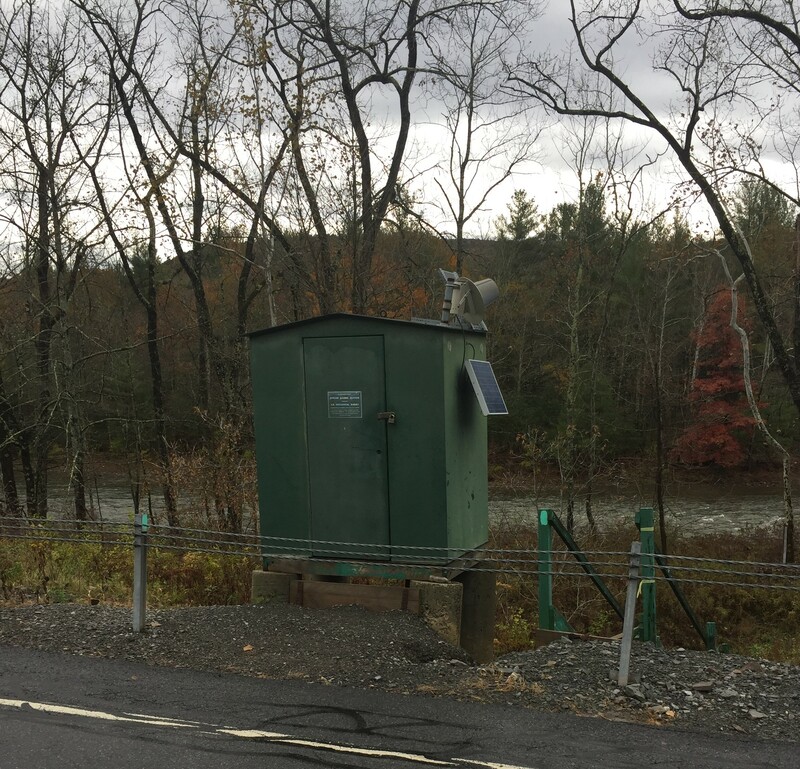 Since October 1996, records for periods when flows bypass the gage are furnished by the New York Power Authority. EXTREMES FOR PERIOD OF RECORD.--Maximum discharge, 119,000 ft³/s, Aug. 28, 2011, from New York Power Authority, gage height, 22.00 ft, outside gage height was 22.34 ft, from floodmark; minimum, no flow, Oct. 12, 15, Oct. 16 to Nov. 1, Nov. 2, 1972, Sept. 12, 13, 14, 1973.